So Beirut Art Fair (and its younger offspring Beirut Design Fair) are the talk of the town these days. Of course, Lebanon has had (and still has!) its political ups and downs but the fair(s) seem to take them in their stride. One thing is for sure, Beirut Art Fair - at least this year's edition - is quite comprehensive, diversified, and indeed upscale. Sure, having it in the "seaside arena" where one has to go through a long road to get there already means it is an exclusive event (I had a ticket for the VIP night but chose to go on the public days). Apart from the galleries there is a section called "across borders" which focuses on photography in Lebanon - to be honest featuring all the usual suspects, but that is OK, as anyone who has been living under a rock for the last 40 years would have learned new names, and those of us in the know would get to see the works once more. Interestingly, the galleries, many of which are Lebanese, have upped the ante this year. No I am not saying all artworks are worth it, but the selection (of both, galleries and artists) seems to be more interesting in terms of what they are presenting (major props for including works from the Autism Society - which, if the name was not there, one would have thought this would be some naif artist a la Khalil Zgheib with artworks selling by the 6 figures - the watermelon above is one such example by the way!). Do note, I am not denigrating the works even if quite a few of them are expected, on the contrary - it was a haven of art in the city, surrounded by lovely (contemporary) works. 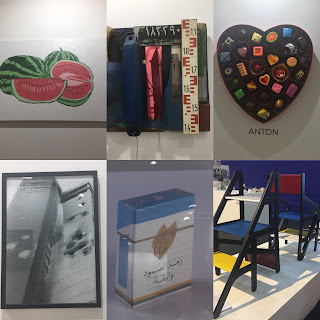 No digital artworks interestingly - and of course, just seeing so many works of Paul Guiragossian agglomerated in one space is in itself worthy of the visit. The Design fair too is quite worthy - and doing both at the same time is not exactly for the faint of heart as there is so much material to cover. The beautiful installation "Saint Balech" by Dona Maria Feghali and Charbel Samuel Aoun about the vanishing (as in privatized) Beirut shoreline is truly lovely and endearing (the deck chair at the top which goes not you see any beach is a funny wink). Elsewhere, the nostalgia feel was present throughout the design fair which is understandable surely - first because many iconic designs were not born today, and second because of all the emotional reassurance that comes from vintage elements in terms of craftsmanship and storytelling (plus rarity of the pieces). But the stand of 1% architecture is indeed a highlight. Their chaise-escabeau is a delight to look at and see - the one exhibited was a tribute to Gerrit Rietveld and Piet Mondrian - and the chair, like the name implies, can become a stool simply by flipping its upper part. In the hand of lesser designers this would have been a silly ikea-worthy gimmick but Waldemar Faddoul, the brain behind 1% architecture takes his jokes seriously. The public has until tomorrow (23rd of September) to visit the exhibition(s) which run in parallel, both being catchy and interesting, in addition to informative - and for a brief time "depaysants" from the ghost town that seems to be downtown Beirut as of late.